The 16th Wymondham Music Festival just had to include the famous Midsummer Jazz Picnic down by the river Tiffey which has has turned into THE event in Wymondham’s summer programme. The organisers even know of locals who arrange their holidays so as not to miss it! Last year there were well over a thousand people enjoying a a relaxing al fresco evening, eating, drinking and listening to the music of DixieMix. 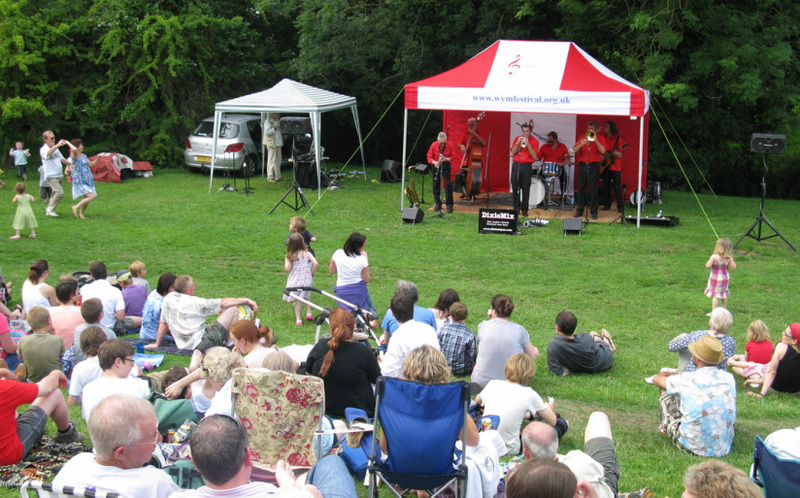 This year on June 27 there were probably double that number of people, families and friends, complete with picnic or just a glass of wine, packed onto Becketswell Meadow for the return of the ebullient and highly entertaining DixieMix – East Anglia's Hottest Dixieland Jazz Band. It was not just the music that was hot, the temperature soared to near record levels giving the hottest day so far this summer. The band played brilliantly and enjoyed the event every bit as much as the cheerring and enthusiastic crowd. Late in the evening, as the dancing finished and the band's final encore echoed against the Abbey, people were still in line for more ice-cream and were very reluctant to leave. Here are some pictures of a truly great event – well done Wymondham.